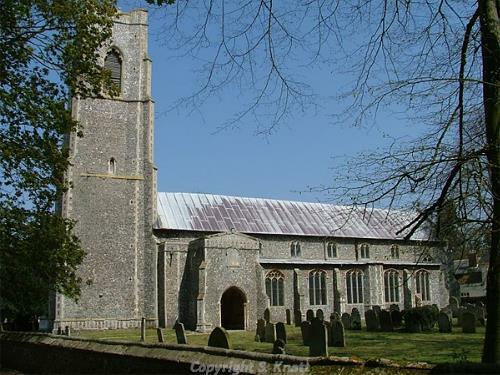 The parish of Scottow is situated in northeast Norfolk, north of Coltishall and northwest of Tunstead. Its name comes from the Old English for ‘spur of land belonging to Scots’. Scott originally meant ‘Irishman’ but was later applied to Gaels in Scotland. The settlement has a long history, and was certainly well established by the time of the Norman Conquest, its population, land ownership and productive resources being extensively detailed in the Domesday Book of 1086. The earliest evidence of human activity comes in the form of prehistoric but otherwise undateable worked flint tools (NHER 39449 and 39593). So far, there have been no Palaeolithic or Mesolithic finds and the Neolithic period is represented by a flaked flint axehead (NHER 29668) and a scraper (NHER 39449). A barbed and tanged flint arrowhead found in the same area as the scraper may be Neolithic or Early Bronze Age. The Bronze Age may have left evidence of the earliest structures. Two ring ditches (NHER 36731), the flattened remains of round barrows, have been tentatively identified north of Scottow Hall from aerial photographs. Bronze Age finds to date are pottery fragments (NHER 39449), a stone axehammer (NHER 24453) and the rim of a pottery urn (NHER 7667). Iron Age finds consist of pottery fragments (NHER 39449 and 45407). Roman finds consist of pottery fragments (NHER 39449 and 39593) and coins (NHER 39449). However, aerial photography has identified the cropmarks of two possible Roman field systems (NHER 36732 and 36731) and a possible temporary camp (NHER 36729) near the Fen Causeway Roman road (NHER 2796) that runs east to west through the parish. At the moment, Saxon finds are limited to pottery fragments (NHER 39449 and 39593). The medieval period has left the earliest surviving building, All Saints’ Church (NHER 7701). A big church in almost every detail, All Saints' sits in a pleasing estate village of largely 19th century housing, tucked into the edge of the former RAF Coltishall airbase. Of flint with stone and brick dressings and a leaded roof, it dates to the 14th and 15th centuries with later restorations, and is an interesting mixture of styles. The 15th century two storey porch has a vaulted ceiling with a fine green man centre boss and an early 18th century memorial tablet over the doorway. The tall slender 15th century battlemented west tower has diagonal buttresses, a contemporary west window and bell openings that have lost their tracery. The nave has north and south aisles with a clerestory above, the chancel being in proportion to the rest, with a big east window with flowing tracery. Inside, the rood beam can still be seen crossing the nave, a rare survival. The font is octagonal in 13th century style, but probably a copy, with an 18th century cover depicting four dolphins. A fine medieval altar slab in the chancel has been preserved in a case as a memorial, and not far away there is a small chalice brass to a priest. On the north side is a big obelisk to Davey Durrant (who died in 1759). The nave has box pews, wall paintings and a 17th century double-sided carved oak lectern brought in from a London church in 1876. The organ case is covered in a rich array of carved Renaissance panels, probably also brought in. Finally, there are two sets of Royal Arms, a vast one for William and Mary in the south aisle, and one to Elizabeth II above the south doorway. A medieval castle (NHER 13084) is reputed to have stood somewhere in the parish, but there is no trace of it today. Medieval objects recovered include pottery fragments (NHER 39449 and 39593), a floor tile (NHER 39449) and a coin (NHER 39696). Of the post medieval buildings in the parish, probably the oldest in origin is Colks Farmhouse (NHER 47224), which is early 18th century with a 17th century west gable wall, though it has been much altered and added to since. The Three Horseshoes pub (NHER 47833) next to the B1150 is an 18th century two storey thatched brick building with a 20th century verandah across the façade and a central panelled door in a plain doorway. It has a single storey canted bay extension to the left gable wall with brick attached columns to the exterior angles. The long barn (NHER 13083) at Hall Farm is also 18th century and to its northeast is a disused 19th century ice-house (NHER 7700). Scottow Hall (NHER 7699) is a late 18th century two storey rendered brick house with a slate roof. The south façade has five window bays, the centre three recessed, and a later stone doorcase with an open pediment on console brackets and a panelled door. The east range has thirteen window bays with a Gothic two storey canted bay in the centre. The west façade has seven window bays and a Roman Doric porch. The adjacent stable block is of the same date as the house, with an earlier west gable and a wooden lantern. Fairstead (NHER 47225) is a 19th century and earlier two storey thatched brick and flint cottage with scattered 19th century casement windows to the front, and evidence on the right gable wall of the roof being raised from a single storey. A windmill (NHER 13104) once stood in the north of the parish, and is marked on a map of 1797. Although nothing can be seen of it on the ground today, Mill Common and Mill House Farm commemorate its former presence, and where it stood can be seen on aerial photographs as a circular cropmark (NHER 36733). During World War Two, the face of the parish was dramatically changed when Coltishall Airfield (NHER 7697) was opened as a base for fighter aircraft. The base remained in continuous use after the war until it was closed in 2007. Its blast walls and other Cold War defences are of national importance. Three pillboxes (NHER 16787, 18918 and 32550) associated with perimeter defence of the airfield still survive. Another (NHER 14971) that stood opposite the church has since been demolished. There are relatively few entries on the record for a parish of this size, but this is probably just the result of a lack of detailed investigation, and it is thought that a great deal more information is yet to be had. For example, a large proportion of the finds at the time of writing were recovered from site NHER 39449, a field to the northwest of Scottow village that was extensively investigated in 2003. It is likely that similar future work will increase our understanding of the area. P. Aldridge (NLA), 6 June 2007.